If St. Augustine was looking through a portal into the future when he wrote that: “He is a slave to a sign who uses or worships a significant thing without knowing what it signifies..", it would be noted that he was making reference to the article in the Huffington Post by Suzanne DeWitt Hall entitled: Jesus: The First Transgender Man (see http://www.huffingtonpost.com/…/jesus-the-first-transgend_b… ). But then again, so too can it be said that the Church Father Origen was making reference to this article when he posed the question: "What man is found such an idiot..." not to seek out the deeper spiritual meaning, concluding that: "I believe that every man must hold these things for images, under which the hidden sense lies concealed”. To suggest that Suzanne DeWitt Hall is clueless as to the spiritual meaning of the allegorical symbols she denigrates, is perhaps eclipsed only by the Huffington Post's willingness to publish such ignorant trash. When Suzanne DeWitt Hall passes over to the Hereafter and takes account of her life -- discovering that she has made little progress towards fulfilling the objectives of the life she was living -- she will wish at that point that she possessed a knowing understanding of these allegorical symbols that are important aspects of the scriptures as the Key of Knowledge ( http://KeyOfKnowledge.org ) -- only then will it become apparent to her just how clueless she was. And she will begin to understand the statement in the Gospel of Thomas: "...But if you will not know yourselves, you dwell in poverty and it is you who are that poverty". Without knowing the important meaning of these symbols she denigrates, it remains impossible to fulfill the adage to Know Thyself. If the scriptures are properly interpreted and understood within the environment of one's own Cosmology of Mind and Being, they must be turned within one's own mind in search of self-knowledge and our true relationship to our un-manifest Soul-Self ( http://SoulSelf.org ), and our Soul's relationship to Creator-God. And in her failure to understand what is being conveyed in these universal symbols of evolved and higher consciousness, Suzanne DeWitt Hall will find herself confronted by her own abject ignorance of self and intellectual poverty that she promotes in her writings. 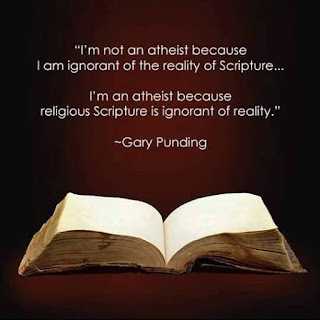 A Message To An Atheist - Are The Scriptures Out-Dated? I came across this meme on the right, and decided to address the reasons for the ignorance of believers and critics alike to understand the true meaning and purpose of the scriptures. The Bible does not make much sense to you, because you neither know how it must be used and applied -- and neither do you possess an awareness of your own Cosmology of Mind and Being -- and especially the Laws and Forces of Consciousness. There are two (2) paradigms of reality that all seekers of Truth must come to terms with -- i.e, (1) that the mind of an infant is empty, and in need of being filled by the wisdom of man; (2) that the mind is connected to an inner Source of Knowledge and Truth that must be tapped into. All religions very quickly become corrupted, because it is difficult for the vast majority of mankind to comprehend the reality of the above second choice. In the case of Christianity, once the Church fell under the control of faux-clergy and despotic rulers, the scriptures were very quickly corrupted with the most important teachings removed -- the body of believers who understood the second paradigm of mind were hunted down as heretics -- and the Church institutionalized as a puppet of a series of Roman Emperors who used man-made Church dogma to control the people. Contrary to popular belief, the Jews were condemned by Jesus because they threw away the Key of Knowledge in their outward interpretation of the scriptures (see http://KeyOfKnowledge.org ). Because each of us is born into this world as an embryonic-image of projection of our Higher Soul-Self (see Man As An Embryonic Soul-Image http://SoulSelf.org#EmbryonicSoulImage ) -- and when the scriptures are applied as the author's intended (see http://AnInconvenientTruth.org ), they develop the Intuitive Spheres of Mind that man's culture leaves dormant and atrophied by an over dependence upon developing the mind in accord with the above paradigm number 1, which is based upon the empty mind philosophy. The Gospels Embody The Principles Of Anamnesis http://GospelOfThomas.Nazirene.org#Anamnesis -- and when used as the Key of Knowledge and turned within self, are an integral resource for developing the latent Intuitive Spheres of Mind that connect the person with the Inner Source within them. But what this also means is that the modern Church, as well as those who are seen as biblical experts and scholars -- as well as critics -- all of whom read the scriptures as if they are historical narratives -- instead of events of Inner Mind that allegorically reveal the Forces and Laws of Consciousness -- which means that modern believers, scholars and critics are like the Jews, throwing away the Key of Knowledge -- rendering the scriptures worthless to achieve their intended objective and purpose.